Clothing/Jewelry Description A brand new coat, a size 9 dress and size 6 1/2 shoes. Distinguishing Characteristics Caucasian female. Blonde/brown hair, brown eyes. Nancy was last seen riding in a yellow Volkswagen Bug near her home on Arnett Drive in Holladay, Utah on October 2, 1974. She went out to buy a pack of gum and has never been heard from again. She was a student at Olympus High School and a cheerleader when she vanished, and active in her local Mormon church. Authorities initially classified her as a runaway, but Nancy was only the first of many girls and young women to disappear from Utah during this time period. She was a junior at Olympus High School at the time of her disappearance, a cheerleader, and she had a job as a waitress. She left all her belongings behind, including her cherished jewelry. 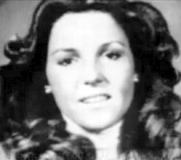 Nancy is believed to have been a victim of the serial killer Ted Bundy. A photograph of Bundy is posted with this case summary. He was executed in Florida in 1989 and confessed to many murders before his death, including Nancy's. She fits the profile of his other victims and he was known to have been in the area at the time of her disappearance, and he drove a Volkswagen Bug similar to car she was seen riding in. Bundy stated she was never in his car, however. He confessed that he abducted her at knifepoint, sexually assaulted her in a nearby orchard, and strangled her. He said he buried her body near Capitol Reef National Park, over two hundred miles from the site of her disappearance. It has never been found. Bundy is also thought to be responsible for the murders of Nancy Baird, Ann Marie Burr, Lynette Culver, Julie Cunningham, Susan Curtis, Georgeann Hawkins, Vicki Hollar, Rita Jolly, Debra Kent, Donna Manson, Denise Oliverson, and many other young women. The women continue to be listed as missing persons. Their remains have never been recovered. Updated 10 times since October 12, 2004. Last updated August 1, 2016; clothing/jewelry description updated.